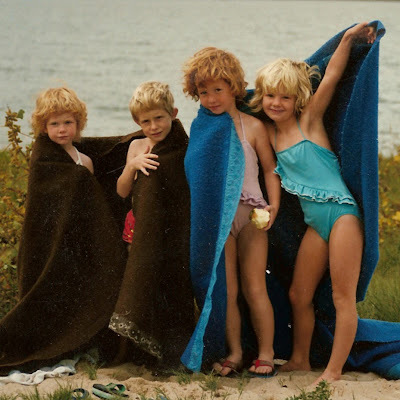 A picture of me and my brother and sisters in 1986 at the lakes! I am the oldest, and I am the one on the far right. Growing up we spent pretty much every Sunday at the lakes with my grandma and grandpa Springer. We would swim all day long and try our hand at fishing with grandpa Springer and my great grandpa Lawrence. Those were the days and I have so many sweet memories of those times! Now that I am married and have two kids, I don't get to the lakes much any more. I hope that this summer we can go more and create some sweet memories with our children at the lakes! Do you have any sweet memories of the lakes? We spent summers at the lake on a houseboat. Oh the memories. Aww---what a cutey pie (and you look so shy and demure too, lol!). oh dear, i just love it. thanks for sharing that cuteness.